2.2.1 Do I Need To seal My Tile Grout? Sealing your grout is one of the best ways to prolong the look and performance of your tile grout by creating a barrier that repels dirt and water. By using a simple applicator and the best grout sealer, you can take on this easy task yourself and safeguard your beautiful tiled finish for years to come. 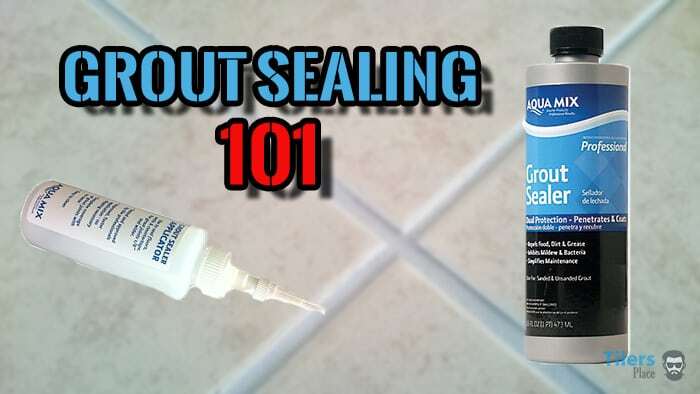 This grout sealing guide is designed for the total beginner and aims to provide the easiest way to seal tile grout with only a couple products. 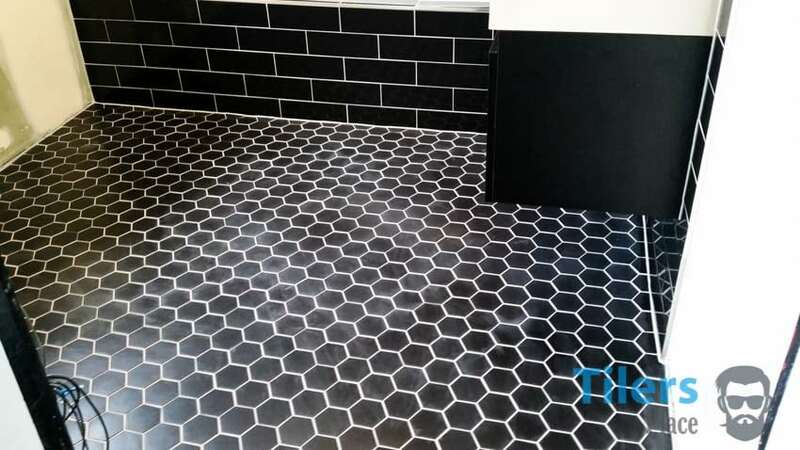 Before we begin the grout sealing guide, we will take a quick look at why we need to seal the grout and why it is an important step in tiling. Grout in its essence is a fine, cement based compound that is enhanced with coloring agents and mold inhibitors. 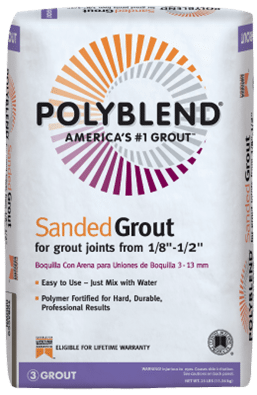 Depending on the type of grout, some have added polymers to increase its strength while epoxy grout contains latex polymers and special liquid compounds that render it closer to plastic than actual cement. We all know what cement looks like, its porous, has lots of gritty aggregates and sands and although it cures to one solid and strong mass, it still retains that porous structure. Your grout, while not as gritty or rough, is still very porous and allows water, dirt, bacteria and mold to reside within it. This all leads to dirty grout and maintenance nightmares as the grout is catching dirt and changing color in random patches across your tiles. A grout sealer acts like a barrier in between the grout and the outside world, effectively stopping any water, dirt and other contaminants to enter it. Once applied, the grout sealer generally lasts anywhere from 3-5 years but an annual reapplication is recommended by manufacturers to ensure the grout sealer is working properly and that there are not any areas where the grout sealer has worn away. High traffic areas or wet areas like showers that see a lot of water would definitely benefit from an annual application of grout sealer. That is why using the best grout sealer for shower floors is a very popular task for modern homeowners as it saves time cleaning in the long run. Grout sealing is not as daunting as it initially may seem and after it is done, the cleaning routine of your tiles will be much easier as the need for scrubbing and heavy elbow grease will be effectively eliminated. Do I Need To seal My Tile Grout? Finally, before you go out and purchase all the grout sealers and tools, let’s quickly see if your grout requires sealing. You should only need to seal your grout if it is a cement based sanded grout as others like epoxy and urethane grout have bulit-in grout sealers and the application of grout sealer would only hinder their performance. You would probably would have been told by your tiling professional whether you should seal your grout or not. If you purchased grout yourself and are not sure, the packaging should mention it. Otherwise, it is best to check back with the retailer you purchased it from to see if it is sanded or not and if it requires sealing. You can also do a visual inspection by looking at the grout and seeing how smooth it is. If it’s fairly grainy or not 100% smooth, chances are you have sanded grout. While the visual inspection is not the best way to be certain, it is better than nothing if you have no other way of telling what kind of grout you have. You can choose any brand that you prefer but I recommend Aqua Mix Grout sealer as it’s dual action. It penetrates the grout surface and seals, ensuring a deeper and more lasting seal, it’s one of the best grout sealers out there and highly recommended. I have been using Aqua Mix products for over a decade and have always been happy with their performance and quality. Not sure which product you require? Check out my Best Grout Sealers Guide. There are many tools that you can use to apply grout sealer, from paint brushes to foam rollers. In an effort to make this guide easy for first timers, I am recommending a special grout sealer applicator. You simply need to pour the product into it and use the brush tip to apply the sealer directly onto the grout. A simple squeeze of the bottle will dispense the product neatly without splashing onto the tile surface. This method makes clean-up much easier as you will be less likely to splatter grout sealer over the tiles which would require extra cleaning up after. If you will be doing larger areas or thick grout gaps, a grout sealer applicator with a foam tip helps speed up the task. Using Nitrile gloves will help keep you safe and protected from the chemicals in the grout sealer. Nitrile gloves are resistant to chemicals and recommended by Aqua Mix during the use of their grout sealer. A couple pairs should be more than adequate for the grout sealing job. Remember to dispose of the used gloves carefully after use as the grout sealer will dry on their surface, making them unsuitable for reuse. You may also want to consider some knee pads as you will be kneeling on a hard, cold surface for lengthy periods at a time. Make sure to give the new grout at least 48-72 hours to cure properly before applying grout sealer. This ensures the grout has finished curing and bonded properly with the tile surface. Sealing it before this time will prevent a strong cure from occurring and thus shortening the life of your grout. If you have old grout, you can follow these steps to properly clean your grout and tile surface before applying grout sealer. While you are waiting for the grout to cure, you can mask off any surfaces you do not want the grout sealer to touch like baseboards or other wooden, metal finishes. 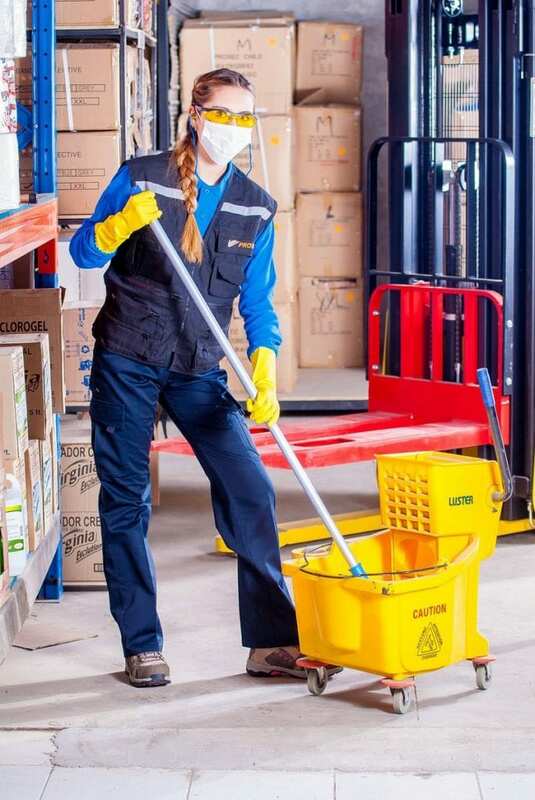 The grout sealer applicator should minimalize any excess solution from spilling out but if there are any areas you are concerned about, it is best to protect them. Once the grout has fully cured and you have masked off any sensitive areas, you can begin sealing. Make sure the grout is free of any dirt or dust and is properly dry. Put on your nitrile gloves and pour the grout sealer into your applicator bottle. Using the paintbrush point of the applicator bottle, apply an even amount of grout sealer solution onto your grout. Be sure to properly cover the whole entire grout gap from tile edge to tile edge. It is okay to saturate the grout with the grout sealer as it will all be absorbed anyway and will help achieve a better seal. If you spill any solution onto your tiles, simply using an absorbent paper towel or microfibre cloth to clean it off before it dries. Follow this procedure until all your grout has a coat of grout sealer applied to it. You will see the grout has turned a darker color and looks wet, this is a good sign that you have applied enough grout sealer. Allow 30 minutes for the sealer to dry properly and then apply a second coat, following the same steps you did for the first coat. The surface will be ready for traffic after 2 hours but keep it dry for 12 hours minimum. A full cure will be achieved after 24 hours, making the tiled area safe for normal use once again. Your grout is now properly sealed and you can enjoy an easy to maintain and healthy tiled environment that inhibits bacteria and mold growth. Please note: Most grouts retain their original color and shade after getting sealed but it is normal for some grouts to remain a bit darker after grout sealing. • To check if you have applied enough grout sealer and have achieved a proper seal, you can drop some water over the grout. If it beads up/puddles, then that means you have applied enough grout sealer to your grout and can use the surface. If the water gets absorbed into the grout that means you will need to apply a further coat of grout sealer. • If at some point you decide to deep clean or acid wash your tiles, the grout will require a new application of grout sealer as it got removed during the harsh cleaning. If you would like to read more about the best grout sealers and learn more about them, I have written a guide to selecting the best grout sealer for your needs. Thank you for this easy to follow and highly detailed guide. I did exactly what you said, ( I literally had my phone next to me with your guide open, and followed it step by step) and water is beading up on my grout! So glad it works! What shall I do if some of the sealer dried on a tile? It doesn’t appear to want to come off. You can try hit it with a mild vinegar solution and give it a good scrub with a scouring pad or similar. If it doesn’t come off you’ll need to step it up with some professional tile cleaning products like “NanoScrub” produced by Aquamix. Alternatively, if it’s a porcelain or ceramic tile, you can just leave it – it’ll wear off in time. Hope that helps! Let me know if you require further help.